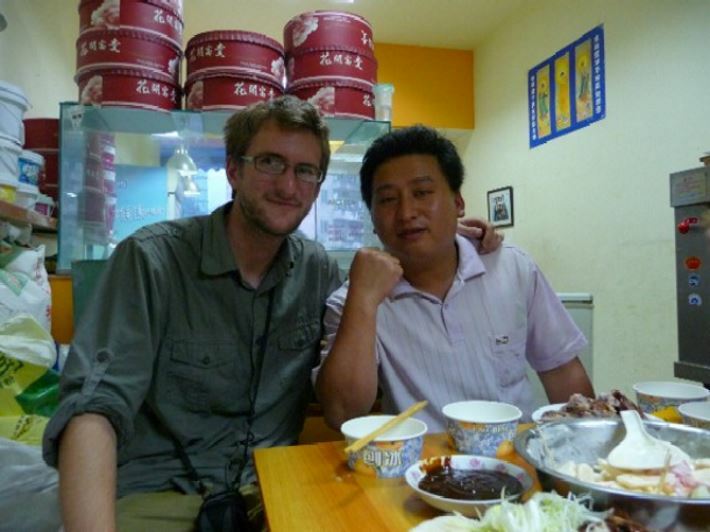 “Gambe”, shouted the Laoban, chinking my bottle of cheap Chinese beer and insisting that I finish what was left. There were smiles and laughter all round followed by his wife placing another pancake full of roast duck in my hand. The Chinese name that I’ve picked up over here is ‘Da Wei’, or ‘Big Stomach’ so I couldn’t let them down. With the excellent Sichuanese food I have no want to either! AV Dave and ‘the boss’. We’d spent our three months teaching English to various classes now and actually we’d only just got back from three weeks backpacking around the country. Waiting around here on campus for a few days before our flight we went to stock up from our bakers that had served us well these last four months. Somehow he’d got wind of our imminent departure and instead of the usual friendly football related banter we could manage with the boss (in Chinese, ‘Laoban’) he invited John and I and a couple of our friends to the dinner the next evening. So here are in the back of the bakery, sitting around a small table with two of our best friends and students, Grace and Anne, a couple of the workers in the bakery and the boss, his wife and adorable little girl that we were all cooing over. When you are told that one of the workers is so excited because this is the first time he has eaten with Westerners, you are humbled. It’s only me! This is the best way to sum up the greatest experience of my gap year – meeting the people of Sichuan. We have travelled half way across the world, to a wild and rural area of China where the culture and way of life is radically different. Philosophies are different, values are different, the food is most certainly different, but kind hearted human beings remain the same anywhere in the world. In fact the way we were made to feel welcomed and encouraged to immerse ourselves into this pocket of China and this community of people was humbling and honouring. An experience like no other. An experience I will never forget. An experience I will chase again. Emeishan has become our home.